Earlier this week, Myst’s spiritual successor Obduction was delayed, sliding back from its proposed July 26 launch date to August 24 next month. Tom seemed to enjoy his time with the adventure puzzler at E3—he also caught up with its creator Rand Miller—and, given the fact that it’s been in the works for as long as it has, Cyan Worlds’ decision to wait until it's “satisfied” makes sense. In the meantime, 100 Stones Interactive’s The Eyes of Ara is a game of similar standing whose idiosyncratic world and head-scratching set pieces echo that of Myst, Riven and the likes of Jonathan Blow’s The Witness. 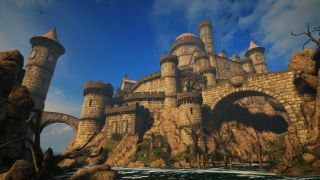 After being dropped onto an unfamiliar medieval-styled island, The Eyes of Ara follows a familiar formula: you explore its fantastical grounds on your lonesome, you engage a series of strange puzzles in order to progress, you spend a sizeable chunk of your time scratching your head, and revel in the fleeting Eureka moments that make you feel smart. Having just passed the 45 minute mark myself, the game’s puzzles are now starting to get really quite challenging—to the point where I’ve fumbled through one or two by accident, with guesswork, or by way of sheer luck. Where earlier puzzles were rooted in logic, the ones I’m up against now demand some pretty mind-bending problem-solving. I love the genre, though, therefore am always willing to suspend my sense of what makes sense in order to enjoy a good puzzle game. If you are too, The Eyes of Ara is out now on Steam for £10.99/$14.99/14,99€.